ARRRRRR!!!!! It's me favorite day on the KMSA Calendar of Feast Days! 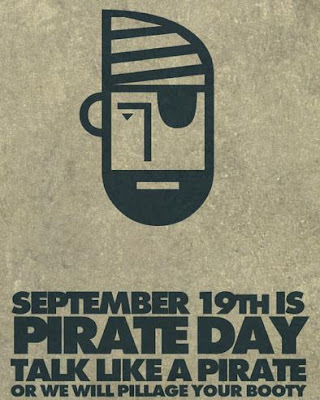 Talk Like A Pirate Day! And how does this ship fit into the KMSA Fleet? Perfectly! 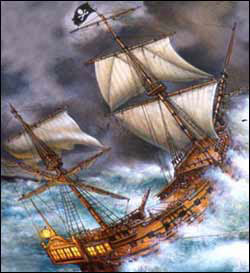 After all...there a many Pirates who where also Knights...Sir Francis Drake just to name one. Part of me official participation in this gallant day of drink and debauchery is to attend the Whydah Pirate Exhibition at the Field Museum in Chicago. Discovered off the coast of Cape Cod, it is the most complete and compelling story of pirate life...which reached its zenith in the late 17th and early 18th centuries off the American coasts and in the Caribbean. 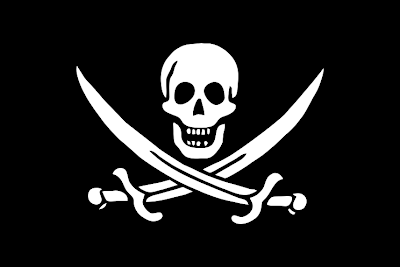 Indeed, I have an official charter to Pirate membership...seeing how I make my living in its now legalized form...ADVERTISING! So, don't bend over darlin'...or I might fire me cannon through your port hole! I love this day, too! Aye.... Wooden eye love to be scuba diving, right this minute , in the shallow, crystal blue waters, off the Spanish Main. With rainbow colored fish curiously circling me as i pick up shiny, gold Doubloons, from the soft sandy seabed, each coin as sharp and bright as the day it was minted. Then end the day, on deck, with a lap full of coins, a big glass of black rum, and a long red sunset. Ahhh Haaarrrghhh. Yes, me lovely Wench T. We were having this discussion last night at Pippins on Rush Street in Chicago. It is the expert opinion of Lady (Wench) Allwinky and Lady (Wench) Mo that there needs to be a Talk Like A Wench Day. I helped them make up phrases like, "Arrr Laddie, is that a yard arm in your pocket, or are you just glad to see me?" "Arrr Laddie, me thinks me likes to shimmy up and down your main mast!" "Hoist me sails over me head and give me a broadside!" And finally, "Would you like to dock your ship in me harbor?" Sir D, you need to meet up with this Ole Pirate and Wench Allwinky in Tortola and Virgin Gorda, BVI. 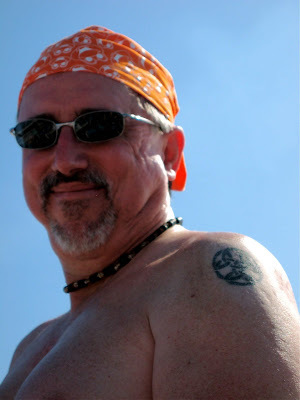 We can sip "Pain Killers" from Aunt Gerties Pain Killer Shack all day off the beach, team up with Captain Steve and crew to fish for dinner and then have it prepared by the chef at Thelma's Hideout as we toast away the sunset. The best part is that if me and Lady A need a spare pair of undies, we can collect the ones that we left staple to the walls at Thelma's during our last visit. Here's to The Victual Brothers!